Why is Sheikh Yusuf al-Qaradawi telling western Muslims to ‘cool it’ for now? — 1389 Blog - Counterjihad! Why is Sheikh Yusuf al-Qaradawi telling western Muslims to ‘cool it’ for now? 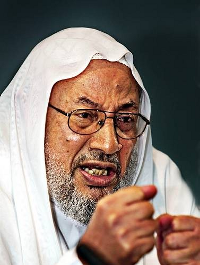 Sheikh Yusuf al-Qaradawi, who, despite what some of his supporters claim, is neither peace-loving nor “moderate”, has warned Muslims in western lands to ‘cool it’ for the time being. As far as Qaradawi and other jihadis are concerned, it will never do to have the public catch on while there is still time to put a stop to their activities. …Qaradawi is referring to those other aspects of Sharia law — you know, subjugation of non-Muslim infidels, absolute authority over women, jihad, draconian punishments, and all the rest — that do create “hardships” for Muslims who try to implement them in the West, for instance, by getting them arrested and imprisoned. In other words, far from “liberalizing” Muslim life, taysir allows only for insincere conformity. As Qaradawi made clear, to practice taysir is not to renounce Sharia’s otherwise harsh obligations; it is to put them on hold till circumstances are more accommodating. Qaradawi’s Muslim Brotherhood colleague, Tariq Ramadan, provides an ideal example: he recommends that a “moratorium” — a temporary ban — be placed on the Muslim practice of stoning adulterers to death; yet he refuses to say that stoning is intrinsically un-Islamic. This, of course, is taysir in practice: because stoning people in the West is liable to get the stoner incarcerated or worse, upholding the Sharia mandate to stone adulterers is “hard” on Muslims living in the West, so best to put it on hold — that is, till circumstances are more opportune. A final observation: the notorious doctrine of taqiyya, which permits Muslims to deceive non-Muslims, is rooted in taysir; in fact, one of the few books devoted to the topic, al-Taqiyya fi al-Islam, spends some time rationalizing taqiyya in light of taysir. And there it is: when Sheikh Yusuf al-Qaradawi, perhaps the most authoritative Muslim voice in Sunni Islam today, calls on Muslims “especially in Europe and America” to practice taysir, he is, in essence, calling on them to practice taqiyya — calling on them to conform outwardly to Western standards while inwardly maintaining loyalty to Sharia. The long and the short of it is that our Muslim enemies are in the process of using western beliefs and ideals, including protections enshrined in the US Constitution, as a cover for their efforts to overthrow and destroy western civilization. This book review by Janet Levy at American Thinker sums up the modern stealth jihadi agenda very well. Within the past few decades, mosques have increasingly dotted the landscapes of American and European cities and towns, with mega mosques often overshadowing adjacent, centuries-old churches in predominantly Christian regions. Islamic schools or academies and a host of Muslim organizations have become omnipresent across the West. Meanwhile, Americans and Europeans have made countless accommodations to Muslim demands. They have included footbaths; high-decibel, five-times-daily calls to prayer; segregated male-female gym and swimming pool hours; halal food; workplace dispensations for handling pork products and for female head and face coverings; and special, public prayer rooms. Also, shari’ah-compliant financial transactions, the expunging of offensive likenesses of Mohammed or imagined depictions of Arabic characters that connote “Allah,” official swearings-in on Korans in place of customary Bibles, the neutralizing of official descriptive language about Islamists and the jihad, the revision of so-called offensive content in movies and television programs, the removal of representations of pigs from the public sphere, and many other acculturations to Muslim entreaties have all been made in the service of respecting Muslim religious beliefs and practices. To those in Western democracies, these accommodating actions appear, on the surface, to be little more than harmless civil gestures, respecting the needs of a growing religion in their midst and welcoming a new addition to their proud, multicultural tradition. Many Westerners pat themselves on the back for their liberal bent, their tolerance and their open-mindedness. Little do they realize that this strategic pattern of demands is part of an insidious, 1,400-year-old proscription for Muslims that originates in the Koran and the Sunnah, the deeds of Mohammed. It is the Hijra or doctrine of immigration. Modeled by Mohammed’s migration from Mecca to Medina, this immigration is not to a romanticized melting pot wherein newcomers gratefully search for opportunities for a better life in liberty and freely offer their talents and loyalty to benefit their new homeland. This is immigration for Islamic expansionism employing ethnic separatism to gain special status and privileges within the host country. Hijra is immigration designed to subvert and subdue non-Muslim societies and pave the way for eventual, total Islamization. Why Barack Hussein Obama finally agreed to the killing of Osama bin Laden — 1389 Blog - Counterjihad!